I saw more sunrises during my six weeks in Madagascar than I’ve seen in my entire life. Fred picked us up at the taxi-brousse station while it was still pitch black out and we began heading north. We watched the sun rise over rolling green hills. Once again, I found myself amazed by how drastic changes of scenery were from one part of the country to another. After an hour or so of rolling through the green hills we made our way into the mountains. Shortly there after, we stopped at a waterfall that was gushing with tinted red water. We spent time in another town because there was a truck stuck on the one-way bridge. Madagascar is full of unexpected twists and turns, but that’s traveling. After waiting for a couple of hours we made it across the bridge and we kept heading north. We passed through desert like areas; coco plantations and we saw the small version of the Tsingy that we had seen in the West. Mango trees were everywhere and soon enough, we saw the sea again. After 58 hours in transit – one night spent on a taxi brousse and another in a roadside hotel, we made it to Diego (Malagasy: Antsiranana). Diego is known for the deep-water harbors, the crumbling colonial architecture, the Emerald Sea, and a few national parks that aren’t too far away. It’s a place where the lush jungle meets the white sand beaches. It’s a haven for wind surfers and deep-sea fishers. Diego seemed to be a melting pot of the many different Malagasy ethnicities and old European traditions. It was humid and with the warmer season approaching, it was getting hotter by the day. As we wandered the city the next day, I felt like I was in an episode of “The Walking Dead.” Not a soul was in sight. Humidity had caused old playgrounds to rust and as a little breeze blew through everything around began to creak. Yellow 4L’s fill Diego’s streets filled with potholes. While a 4x4 is the best bet to get to most places around Diego, there are plenty of taxi-drivers who are willing to brave the rough roads, too. We took a 4L to a small fishing village called Ramena. We picked up a local teacher on the way to school; our taxi driver knew her and asked if it would be okay if we dropped her off on the way. We didn’t see what the problem would be, so she jumped in the car with us. She spoke both English and French, so conversation was easy. She gave us a few recommendations of things to do in the area and pointed out different sights like the Pain de Sucre and the baobab trees along the way. She was a teacher in a small village in between Ramena and Diego, we learned that she walks to school on days that she can’t find a free ride. The drive took 30 minutes, so I can’t even begin to imagine how long the walk must be. When we asked her why she doesn’t live near the school, she told us that she had grown up in that village but moved to Diego so her kids could go to a better school. Nonetheless, she continues teaching in the village she came from. It would have been nice to have more interaction with her, but we dropped her off and that was that. Ramena is the perfect beach town/fishing village to go to if you want to relax on a backpackers budget. Not much is luxurious, and it smells like fish just about everywhere you can walk, but the village was charming. We arrived early, so we watched the fishing boats come into shore with their morning catch while digging our toes into the sand. Slowly but surely, other tourists who wanted to take an old boat out onto the Emerald Sea began to arrive. We climbed in the wood fishing boat and began to head out into the sea. I’ve sailed around the world on a ship, but I’d never seen colors like I saw in the Emerald Sea. Madagascar truly is one of the most beautiful places I’ve had the opportunity to visit. Snorkeling in the warm, turquoise waters surrounded by tropical fish, followed by grilled fish and crab on the beach made for one of the most relaxing and luxurious days in Madagascar. After a day on the sea we traded in our flip-flops for our hiking shoes and went to the Montagne d’Ambre. We shared a 4L taxi with two girls we met at our guesthouse. The ride was great until we were going up hill and our taxi driver told us that we’d need to walk up all of the hills because the car can only make it up with a driver in it. So the taxi drove us the flat distances in between. It wasn’t exactly what we’d imagined when booking the ride, but in Madagascar you just go with the flow. It was probably good for us to hike up all of the hills anyways. When we made it to the park entrance we hired a guide and began exploring the park. We saw at least 100 chameleons and lizards while hiking through the park, lots of lemurs and at least 15 spiders too many! I’ve never seen a city transform so quickly overnight like Diego transformed on our last day in town. A cruise ship stopped in the bay for the day (they were in town from 8 a.m. until 6 p.m.). Suddenly, the storefronts that had been boarded up for the previous four days were open. There were dozens of women walking the street and selling fruit in baskets on their head and men were selling hand painted toys and model ships. Restaurants that hadn’t been open any other day were suddenly open for breakfast, lunch and dinner. Tour companies and chauffeurs were everywhere in sight. There were dozens more beggars than there had been other days. We left the guesthouse that morning with no idea that a ship had come in. We needed to get to the bank and the grocery store, so we quickly did our errands before the banks ran out of cash (if you’ve read the other blog posts about Madagascar, you’ll know that’s a common occurrence). We'd been planning on going to the Red Tsingy that day. To get to the Red Tsingy you needed to go in a 4x4, apparently the roads to get there were worse than anywhere else. The problem was that the cruise ship had reserved most of them in town. After a little searching, we met the owner of a tour company who understood we were backpackers, not tourists from the ship. He knew we’d been in town for a few days and was willing to help us out and get us a car. He picked us and a couple we’d met on the fishing boat up at noon and we were off. As soon as we made it to the 17 km stretch to get into the Ankarana Nature Reserve, I finally understood why we needed a 4x4. We’d been on some pretty rough roads in Madagascar, but this one was one of the worst. The road was completely eroded away in some spots, leaving nothing but gaping holes and boulders sticking out in some areas. We made it half way down a path when we ran into a taxi-brousse that was broken down. There was no way around the mini-bus, unless we wanted to fall to the bottom of the canyon. Our driver laughed and said “pas de problème” (no problem)! He reversed the car and gunned it. Then we took the “bad road” down. I don’t even know how to begin to explain the bad road. My palms were sweating, I tried not to look over the edge, I was hoping and praying the wheels wouldn’t fall into the gap in the middle of the “road” that was essentially made of two different cliffs… we made it! We walked a little ways through a stream filled with red quicksand and dirt until we made it to the Red Tsingy that were formed by erosion from wind and rain. 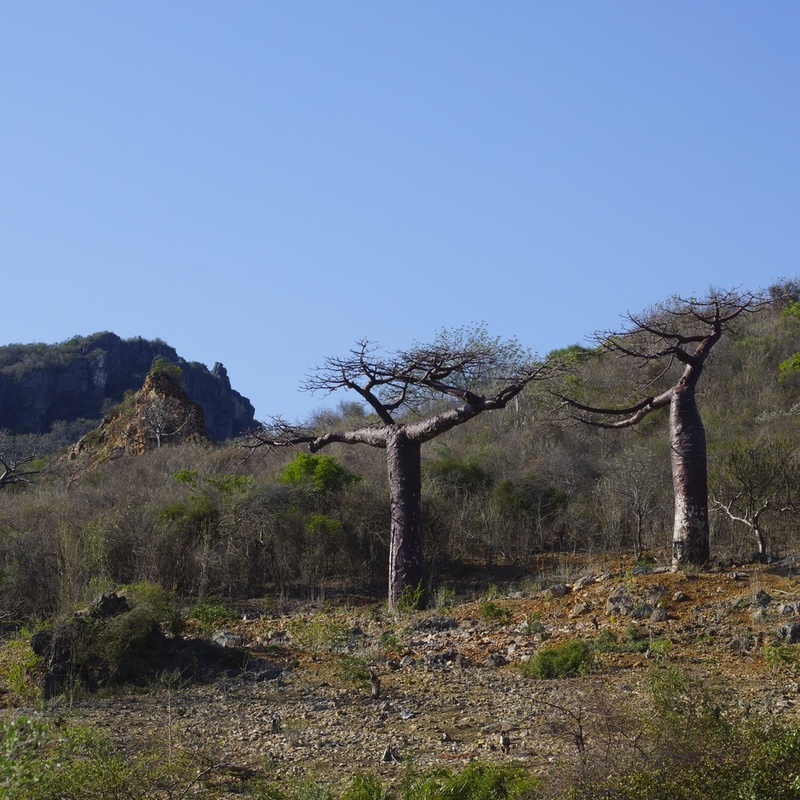 The Tsingy we had visited in Western Madagascar were impressive – the Red Tsingy were bizarre. It looked like another planet – we could have been on Mars for all I knew. Our nights were spent on the roof of the guesthouse watching the sunset and exchanging stories with other travelers. I’d write a little in my journal every night and we’d flip through photos. At our guesthouse in Diego we’d stargaze on the roof at night as we coated on bug spray or citronella (an essential oil used as a bug spray in Madagascar). The next morning we were heading to Nosy Be. We didn’t know how yet, but we were tired and decided we’d figure it out in the morning.